Having been to Santa Fe a number of times, it is always fun and relaxing to again visit those dining establishments that made an impression over the years. This fall the eating adventure led me to sample several familiar popular gourmet dining venues, and none mentioned here disappointed. The Compound, http://www.compoundrestaurant.com/ located just off of artist filled Canyon Road, is an all-time favorite for the sophisticated palate. In an upscale adobe styled dining room, you can succumb to the temptations of; a Stacked Salad of Romaine, Tomato, Ham, Blue Cheese and Hard Cooked Taos eggs with Avocado Ranch Dressing topped with Free Range Chicken. If your luncheon appetite is not quenched, for dessert you might try the Bittersweet Chocolate Marquis of Pistachio Gelato, Apricot Pistachio; or the Orange Olive Oil Cake of Fig Jam, Lemon Curd and Crème Fraiche. Your evening plans might include a return to the Compound to enjoy a night cap or light supper at the intimate bar. With seating only about ten people, reservations are recommended. 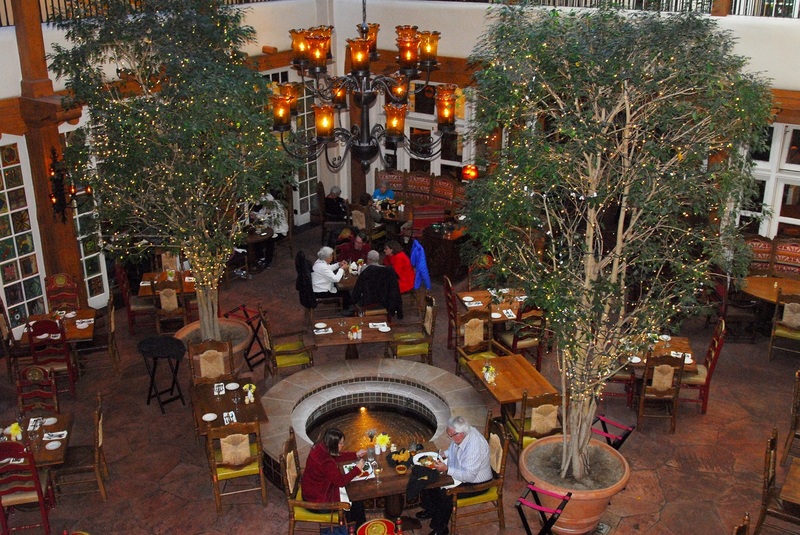 The La Fonda Hotel http://www.lafondasantafe.com/la-plazuela holds many historic adventurous tales due to its early Santa Fe birth in 1640, but the restaurant, La Plazuela, has been a long time favorite for its casual, attentive, and never disappointing selections. Your selections might include: a spinach salad with grilled hazelnuts, with gluten free prosciutto bathed in a cranberry vinaigrette. Your entre might be the Alaskan Silver Salmon with lemon cilantro butter sauce, or sweet and buttery hearty pork tenderloins with pineapple glaze and papaya vinaigrette. Top the meal with a Chocolate Molten Cake of dark chocolate truffles, dark rum cream glaze, which accents the dessert’s warmth and coolness. It is impressive when your server knows the term “Ice on the Pond” when ordering your extra cold, extra dry Martini, which is served to perfection. While the décor has been renovated in recent years, the hand-painted side glass panels remains the restaurant’s signature Santa Fe tradition. 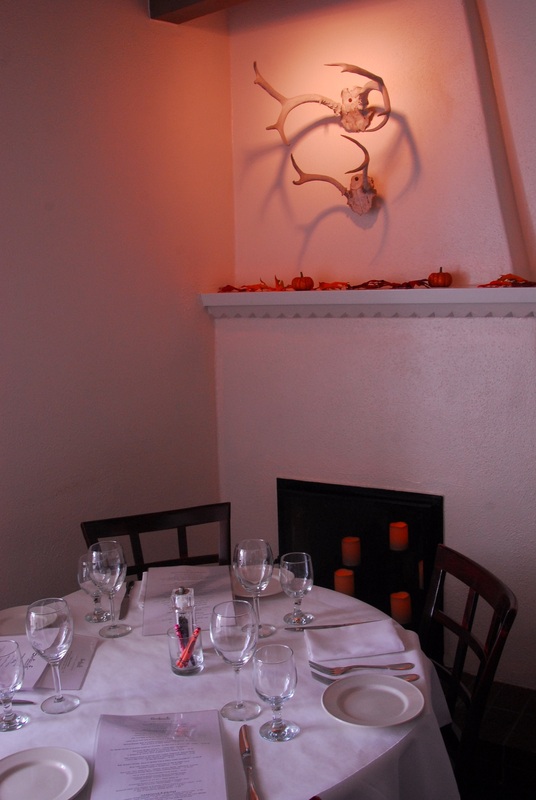 Your high expectations for Santa Fe service, ambiance and dining are always met at La Fonda. Be sure and take time to visit the shops at La Fonda and the outside entrance to the top fashions of Rocki Gorman, a noted fashion and jewelry designer. If you have not discovered the surprising and intimate atmosphere of Santacafe, http://santacafe.com/ you are missing a treat. Here inside white adobe, small dining areas, complete with a hint of Georgia O’Keeffe styled décor, you will find the best fresh Chimayo Red Chile onion rings available anywhere. But this seemingly simple appetizer is only a prelude to an array of tasty selections including: Blue Corn Chicken Confit of enchiladas of red and green chili, or the healthy pan seared salmon roasted with fingerling potatoes over a kale and spinach lime cream. It’s known during high season to have one of the best outdoor patios for celebrity sightings. While the Rosewood Inn of the Anasazi has undergone a dining room renovation, to open up the bar for casual tequila tastings and encourage conversation, the restaurant retains its elegant atmosphere and gourmet menu. You might start off your evening with a Kettle One Citron Pomegranate Martini, or a selection from one of their fine wines. A flavorful good soup is an invitation to a gourmet meal and the Anasazi sweet potato soup was a perfect complement to the autumn weather. The Buffalo Empanada over an Avocado Mouse is personally recommended as is the fashionable crusted Salmon with baby beets, parsnips in a tamarind sauce. For dessert, you can play like a child with the Fried Ice Cream reminiscent of an outdoor campfire’s s’more. You can’t leave Santa Fe without a nighttime visit to La Cantina next to La Casa Sena restaurant http://lacasasena.com/ . At the Cantina, the waiters treat you, between serving food courses and beverages, with their favorite contemporary and Broadway styled songs. Many of the talented singers are biding their time here, saving their money before jumping into the Broadway pool of performers. Feel free to order a Mexican styled dinner, or just a beverage with their chips and dip. 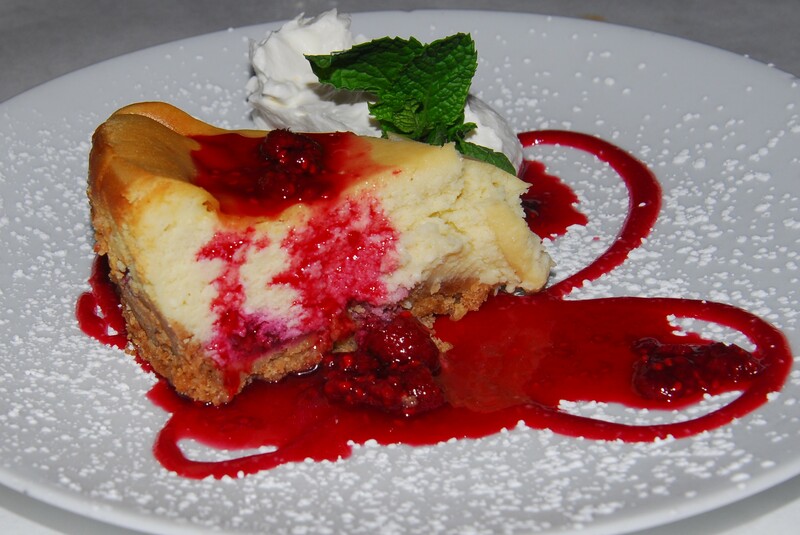 The congenial atmosphere, the prompt and friendly service is a fitting farewell to the enchantment that is Santa Fe. Consider your Santa Fe visit between high tourist times like the Santa Fe Opera Season or the Indian Market. In this way you can be assured of obtaining your preferred dining reservation times, and Santa Fe will have a more accessible feel and friendliness.